Where’s All the Oil Going? Today’s piece is a nice little graphic from the Economist about the oil and natural gas industry in the United States. We have a bar chart that does a great job showing just how precipitous the decline in Chinese purchases of oil and liquid natural gas has been. Why the drop off? That would be the trade war. Will they take it? For all the tea in China? The second graphic, on the right, is far more interesting. 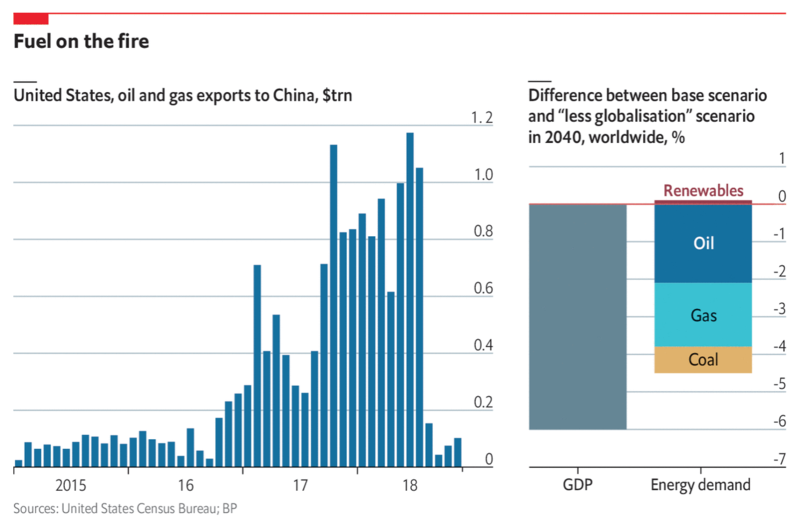 The data comes from BP, so the proverbial grain of salt, but it compares expected GDP and demand for energy by source from a baseline model of pre-Trumpian trade war policies to a future of “less globalisation”. Shockingly (sarcasm), the world is worse off when global trade is hindered. You all know where I stand on stacked bar charts. They are better than pie charts, but still not my favourite. If I really want to dig in and look at the change to, say, coal demand, I cannot. I have to mentally remove that yellow-y bit from the bottom of the bar and reposition to the 0 baseline. Or, I could simply have coal as a separate bar next to the other energy sources. Author Brendan BarryPosted on 27 February 19 27 February 19 Categories InfographicTags bar chart, China, data visualisation, Economist, energy, foreign trade, infographic, information design, trade war, United StatesLeave a comment on Where’s All the Oil Going? Following up on yesterday’s post about the facts on tariffs, today we look at an article from Politico that polled voters on their feelings about trade and trade policy. Now the poll dates from the beginning of June and unfortunately a lot of things have changed since then. But, the data overwhelmingly supports the conclusion that voters, at that time at least, do not support placing tariffs on goods coming into the US. 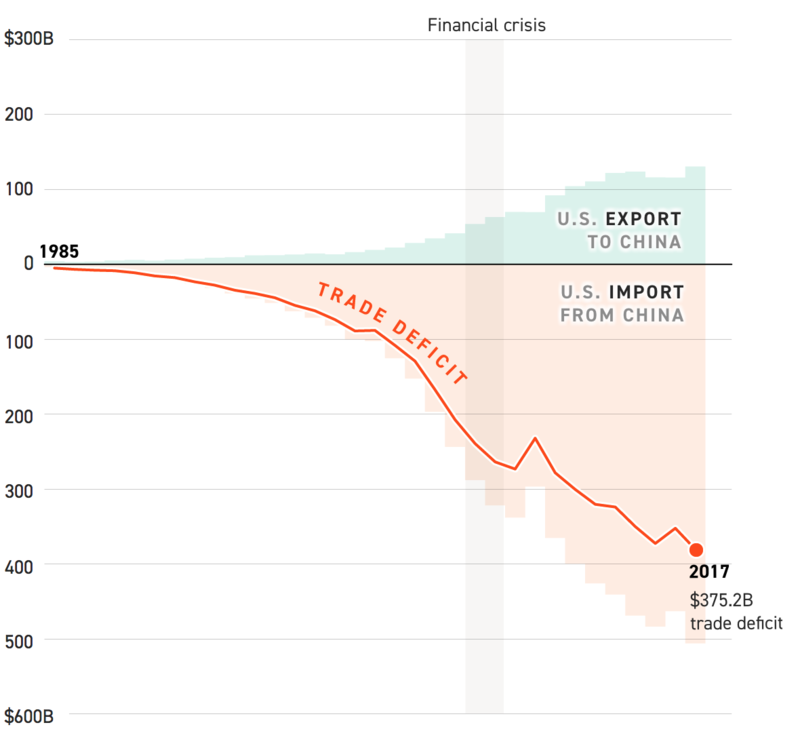 Let’s take a look at another component of the article, however, a chart exploring the infamous trade deficit. First of all, trade deficits do not work like how the president says they do—but we will come back to that in another post. In short, trade deficits are neither good nor bad. They are just one way of describing one facet of a trade relationship between two countries. This piece looks at the trade balance between the United States and China. Now, from the topical standpoint, it does a really nice job of showcasing how our imports have surged above our experts. From a topical standpoint, however, we do not know if this is a total trade deficit or just in goods, like the president prefers to talk about, or in goods and services, the latter of which accounts for way more than half of the US economy. From a design perspective, I have a few thoughts and the first is labelling. The chart does label the endpoints of the data set, 1985 and 2017. But aside from a grey bar representing the Financial Crisis, there are few other markers to indicate the year. In smaller charts, I often do this myself, because space. But here there is enough space for at least a few intervening years to be labelled. Secondly, the white outline of the red line. I have talked before of a trend to showcase a line over other lines with that thin stroke. But this is the first time I can recall the effect being used over an area filled with colour. Is it necessary? Because the area is light and the line dark and bright, probably not. Then the outline appears on the text in the graphic, in particular the labels of imports, exports, and the trade deficit label. The labels for the imports and exports likely are necessary because of that light grey used for the text. But, as with the line for the trade deficit, its label likely provides sufficient contrast the thin white outline isn’t necessary. Credit for the piece goes to Jeremy C.F. Lin. Last Friday China seized a US Navy submersible drone—like the drones the Air Force uses but for underwater purposes—in international waters off the coast of the Philippines. 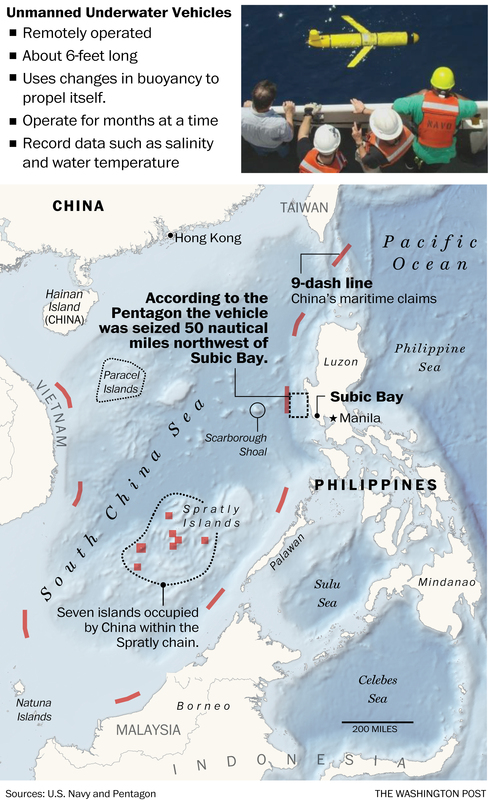 This graphic from the Washington Post shows how, while in international waters, the seizure occurred not far outside China’s Nine-dash Line, which they claim as territorial waters. Today’s post features a simple set of graphics on the BBC, however the creators were actually the Asia Maritime Transparency Initiative. The background? 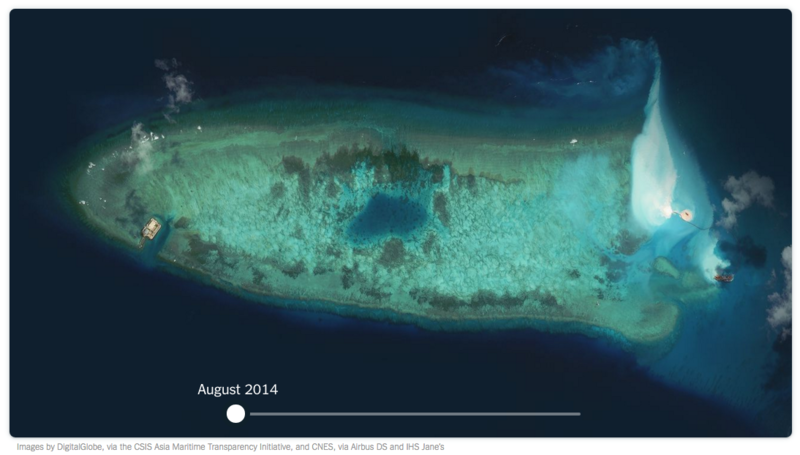 The increasingly tense geopolitical situation in the South China Sea, where China claims numerous islands and reefs claimed by other countries—and to a smaller extent other countries make similar such claims. Just a few weeks back, the Hague ruled against Chinese claims against islands within the Philippines territorial waters. But as these graphics show, it takes more than a legal decision to effect change on the ground. 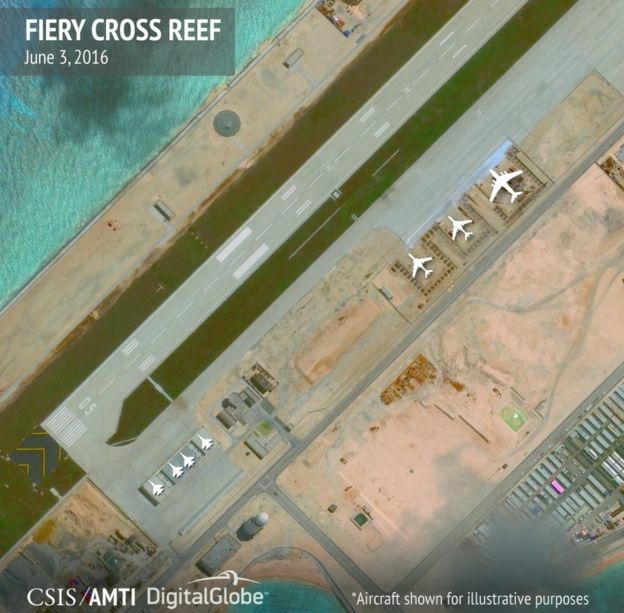 Satellite photography shows military installations on numerous Chinese-held islands. But what makes the images potent in the communicative sense is the simple overlay of white plane illustrations. They show how many fighter jets, support aircraft, patrol aircraft, &c. that China can base at the various military installations. It is a simple but incredibly effective touch. 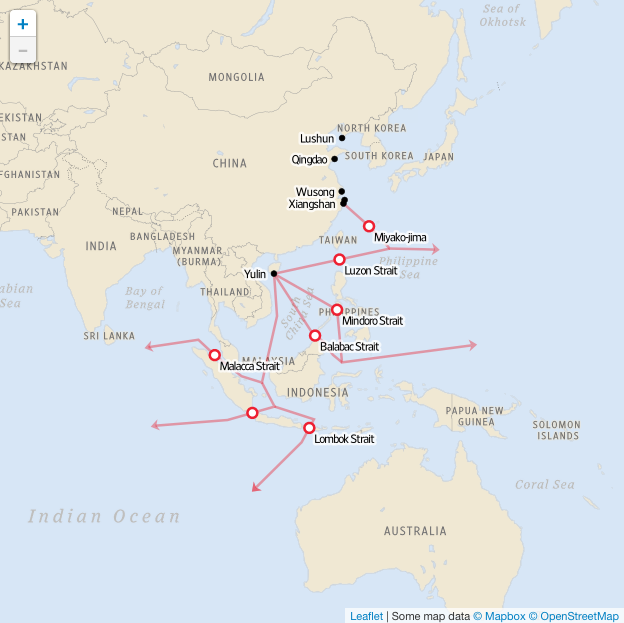 Credit for the piece goes to the Asia Maritime Transparency Initiative. Apologies for the lack of posts the last two days. I visited Wisconsin to trace some of the courthouse records of the Spellacys. And while I will try to return to them later next week, today we go to China. 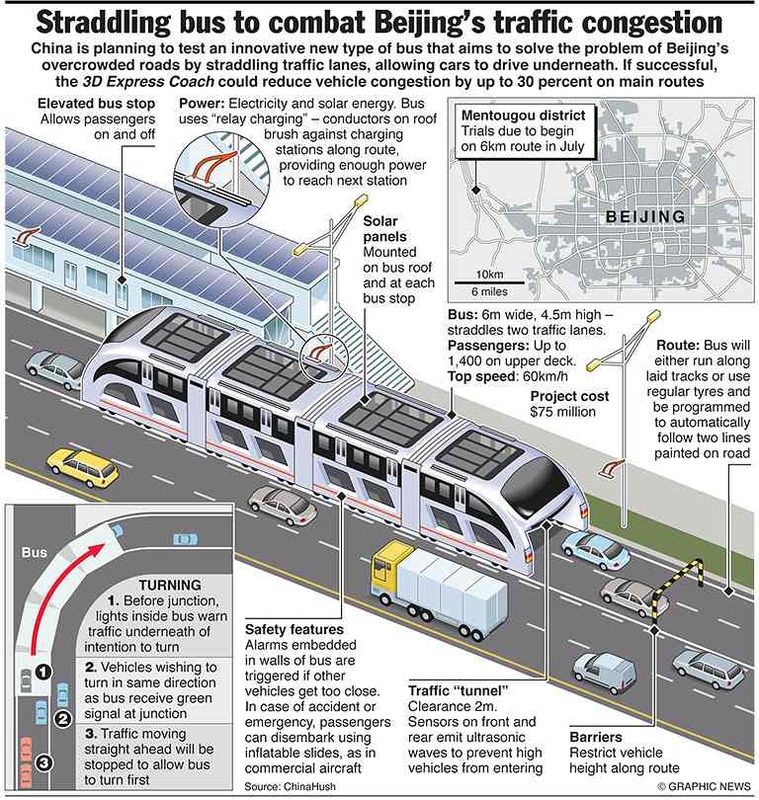 During my recent holidays, the media made much ado about a new straddling bus in China. Except that it’s not that new. And now it might not be real or at least really viable. I recalled this graphic from 2012 via the Guardian and decided it would be relevant to try and explain how the bus should work. Credit for the piece goes to Graphic News. 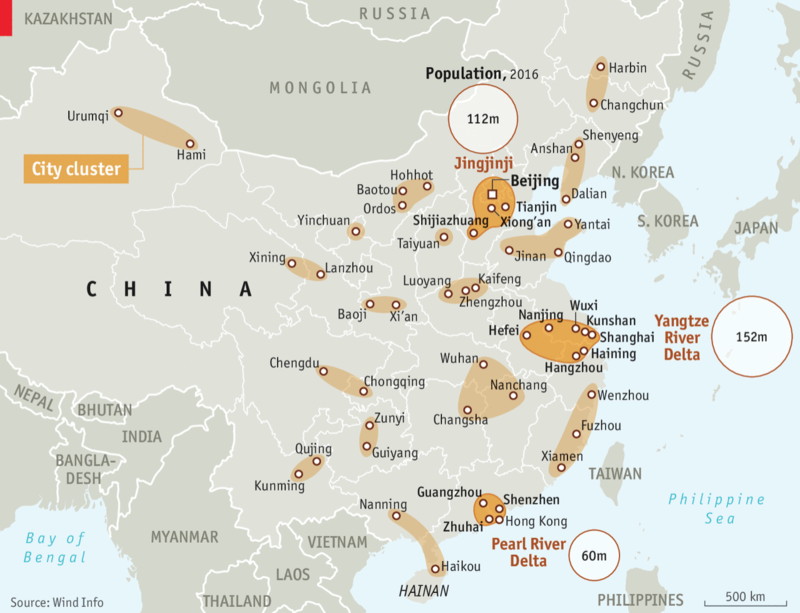 Okay, so the title might be a bit hyperbolic, but the point that China has spent the last few years expanding minor reefs into major military installations still stands. This New York Times piece is a few months old at this point, but through a combination of maps, photography, and diagrams, it illustrates what has been going on in the South China Sea. The screenshot above is of the first still in a short time lapse video introducing the article If you do not have the time to read the entirety of the piece, just watch the video. A lot can happen in one year. With Xi Jinping visiting the United States the BBC published an article looking at China’s changes over the years. In general, I don’t like the article—why are they using pigs to look at pork consumption? My general dislike aside, they do have a map that plots urban centres with more than one million people and how that map has changed since 1970 and will change out to 2030. I probably would not have used that terrain map as the background as blue-green circles on the green coast are a bit difficult to read. A lost opportunity of a sort—assuming it is possible at all—is to use a satellite image of China for each year and overlay the circles on that. 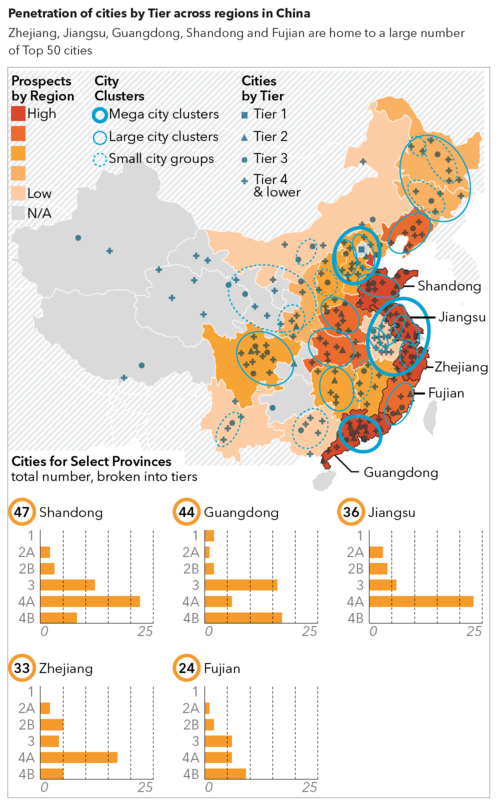 One can only imagine that China’s urbanisation has gone together with drastic changes to the landscape. This weekend the Wall Street Journal published an article that combined my interest in data visualisation with my interest in naval ships. The article looks at the growth of the Chinese nuclear submarine programme. And alongside the article are maps, charts, illustrations, and a narrated video that support the written word. Credit for the piece goes to Alberto Cervantes and the Wall Street Journal’s graphics department. Today’s piece comes from the South China Morning Post. 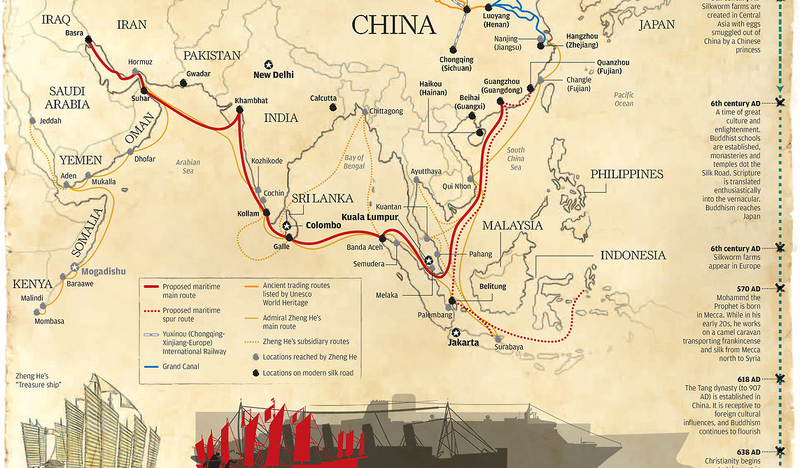 It looks at the Chinese government’s efforts to connect China to trade partners via a maritime route. This is conjunction with efforts to build a railway intended to connect Europe and China via Russia. Credit for the piece goes to Lau Ka-kuen.